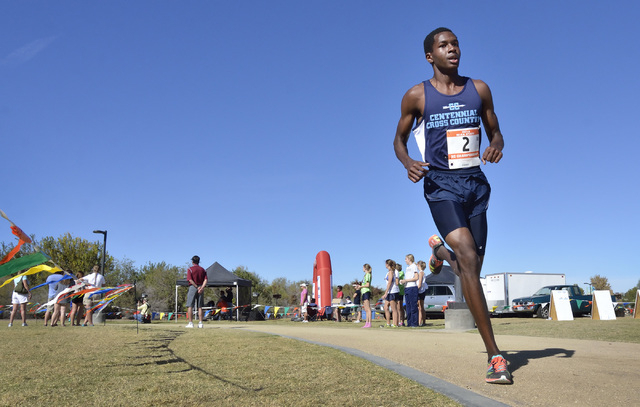 Dajour Braxton could have sworn he heard footsteps in the closing stretch of Saturday’s Division I boys state cross country meet at Sunset Park. The Centennial senior might have heard something, but it was most likely thunderous applause for a record-breaking effort. Tested early in the race, Braxton pulled away in the final mile and finished strong, completing the 3.1-mile course in 15 minutes, 34.2 seconds to win the state title. 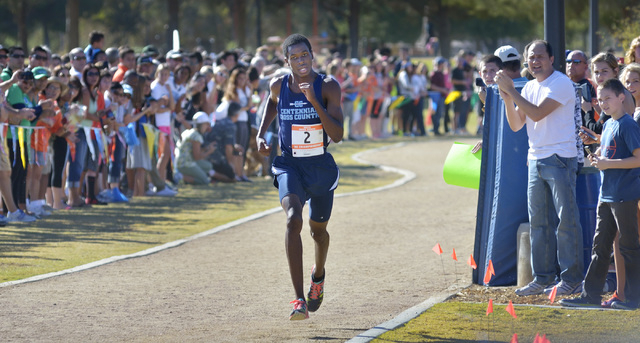 His time was 10 seconds faster than the course record he set Oct. 30 in the Sunset Region meet. 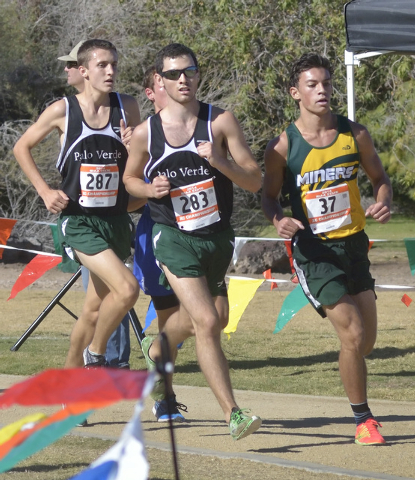 Braxton, who finished third in the 2012 and 2013 state meets, was pushed early by McQueen’s Kai Benedict and Connor Ross and Green Valley’s Austin Rogers, but he opened a two-stride lead just past the midway point of the race. He led by three seconds at the 2-mile mark but saved his best for the final 1,600 meters. Benedict finished second and Ross third to help McQueen easily win the team title. The Lancers, ranked 30th nationally by dyestat.com, had 27 points. Green Valley was second with 81. Chase Wood ran the final 200 meters as though it were a 50-yard sprint. He didn’t need to. The Faith Lutheran junior already had the Division I-A race in hand. Wood, who finished third in last year’s state meet, wasn’t about to let anyone take Saturday’s race away from him, sprinting to the finish line in 16:37 to capture the state title. Wood, locked in a battle with Truckee’s Noah Oberriter and Elko’s Kyler Simpkins for most of the race, had the strongest finishing kick and won by seven seconds over Simpkins. Oberriter was third in 16:47.1. Spring Creek won the team title with 50 points to runner-up Clark’s 70. Silver Stage’s Brandon Perez won an exciting race, separating from a pack of four runners in the final 200 meters to finish first in 17:49.3. Sage Ridge’s Ethan Hardacre was second in 17:55.1. 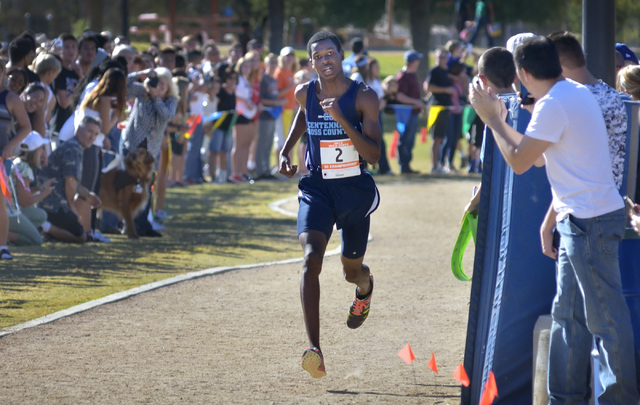 Adelson School’s Cutty Zanghi was the top Southern Nevada finisher, placing ninth in 18:32.1. North Tahoe won the team title with 31 points. Silver Stage was second with 59. Understandably, Kayla Roberts looked a little dejected just after finishing. In the lead for much of the race and running better than even she expected, the Centennial sophomore lost out to a strong finishing kick by Douglas’ Lindsey Adams. What Roberts realized moments later was her second-place effort helped the Bulldogs win the state title. The state runner-up each of the past two years, Centennial got strong showings from its entire team and won its first state crown since 2000. The Bulldogs scored 45 points to Palo Verde’s 62. Douglas was third with 83. 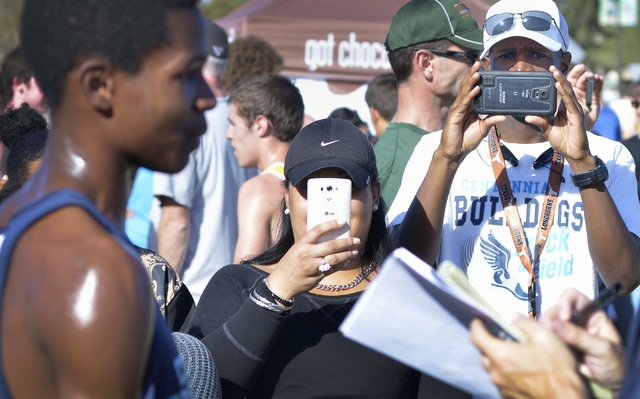 Roberts, who finished 12th last year, was second to teammate Alexis Gourrier in last week’s Sunset Region meet. Roberts led Adams by 13 seconds with about a mile left, but the Douglas runner kept pecking away at the lead and passed Roberts with about 200 meters remaining. Adams finished first in 18:43.3. Roberts was second in 18:46, followed by Bishop Manogue’s Hannah Covington in 19:09.1 and Gourrier in 19:12.8. Truckee flexed its muscle, showed its speed and ran away and hid from the field. Skyler Flora and Gabrielle Rinne re-enacted their 1-2 finish from last year in a dominating effort that helped the Wolverines breeze to the team title. Flora won the race in 18:44.1 Rinne was second in 19:18.4. The Wolverines, who had five of the top eight scoring runners, had 21 points. Spring Creek was second with 34. Del Sol junior Ingrid Zarate was the top Southern Nevada finisher, placing 12th in 20:59.4. The Meadows’ girls stood around after the race, hoping to hear good news. The Mustangs ran a strong race and had six of the top 19 finishers but lost the team title to North Tahoe. The Vikings, who had the top two finishers, finished with 46 points, with The Meadows scoring 48. North Tahoe’s Quinn Lehmkuhl won the race in 19:35.5, and teammate Tara Gallant was second in 20:04.1. Jeneke Heerema paced The Meadows, finishing fourth in 20:40.4.